from my @PinkSewingBus partners @Hobbycraft. Join me @MissLibbyRose as I guide you through how to make this fun and quirky purse. 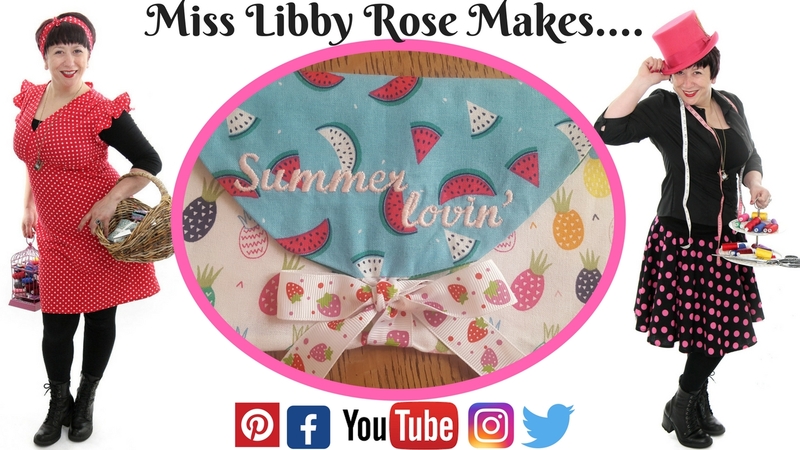 In this video we are making the ‘Summer Lovin’ curvy lined purse’ made with some gorgeous tropical Fat Quarters from my @PinkSewingBus partners @Hobbycraft. Print out your pattern piece at A4 size and cut out around edges. Lay 2 fat quarter pieces whole and place pattern on top (whole) watching your pattern directions as discussed in the video, pin and cut around. Fold the pattern along the dashes as on pattern instructions. Pin and cut 2 x smaller pieces with the pattern folded. Open up this seam, press and fold over so the right sides are showing. Decide which pieces are for your lining and lay the lining sides together so they are right sides together, pin and sew these 2 x pieces around this bottom curvy section. Leave a gap (around 3 x fingers wide) in the centre bottom. Now do the same for the 2 x pieces that are for the outside. Lay with right sides together. This time slide one piece of ribbon (long enough to tie a bow at the end – around 20cm) and place this in the centre bottom (same place as you left the hole on the other side) leave a bit of ribbon poking through so you can stitch this into the purse. Pin and sew around this bottom curved part. You will have 2 x pieces remaining un-sewed at the top. This will make the top of the purse and you will feel like you are closing it all up now. Take the other piece of ribbon (around 20cm long) and place it in the top centre with a small amount poking through on this side and the majority inside the purse. Pin and sew these remaining 2 x top parts to each other with right sides together from stitch line to stitch line, sewing in the ribbon at the top. Go to the hole you left in a previous step and pull it all through here. Push the inside (lining) inside the outside pieces, lay flat and press. Once you are happy you can go inside to the hole and sew up the final part (the hole). Previous post: Sewing with the wives and the #sewingtour begins!